Description: During the procession of temple cart pulling ceremony of lord â€˜Jagannathâ€™, thousands of devotees are gathered on the city street to pull the cart. In this procession, the idol of the god is taken to the one temple from another one on the two stories wooden made cart which is hand pulled to the destination by the thousands of peoples. A devotee is also present at the celebration wearing a cloth printed with some spiritual holistic words, which imparting his strong faith on the sacredness of life. Caption: During the procession of temple cart pulling ceremony of lord â€˜Jagannathâ€™, thousands of devotees are gathered on the city street to pull the cart. In this procession, the idol of the god is taken to the one temple from another one on the two stories wooden made cart which is hand pulled to the destination by the thousands of peoples. 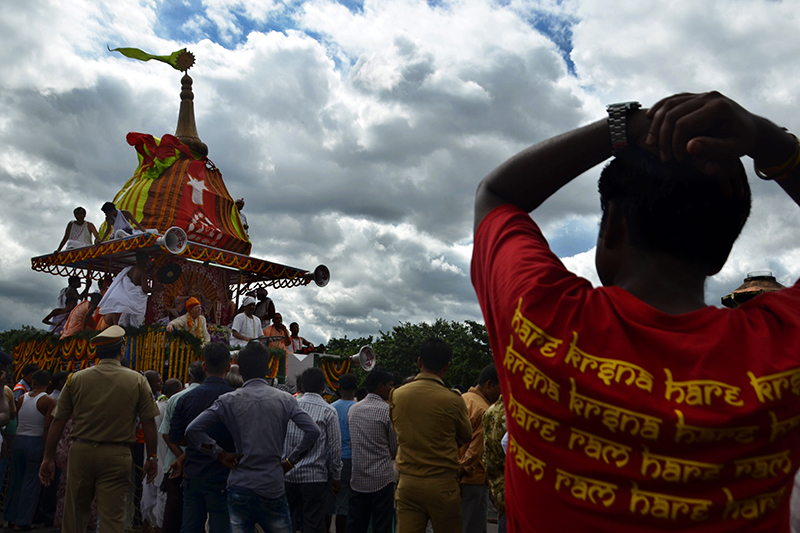 A devotee is also present at the celebration wearing a cloth printed with some spiritual holistic words, which imparting his strong faith on the sacredness of life.